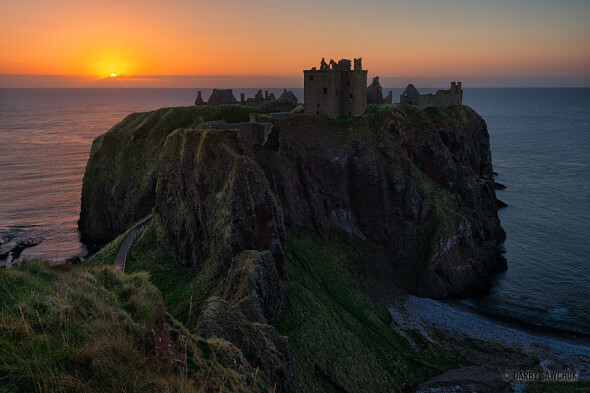 The sun rises behind Dunnottar Castle in Aberdeenshire, Scotland. I’ve posted a few photos of Eilean Donan Castle here so I won’t bore you with my waxing poetically about the beauty of the place. Here’s a panoramic image that should speak for itself. Click here for more of my photos of Scotland. 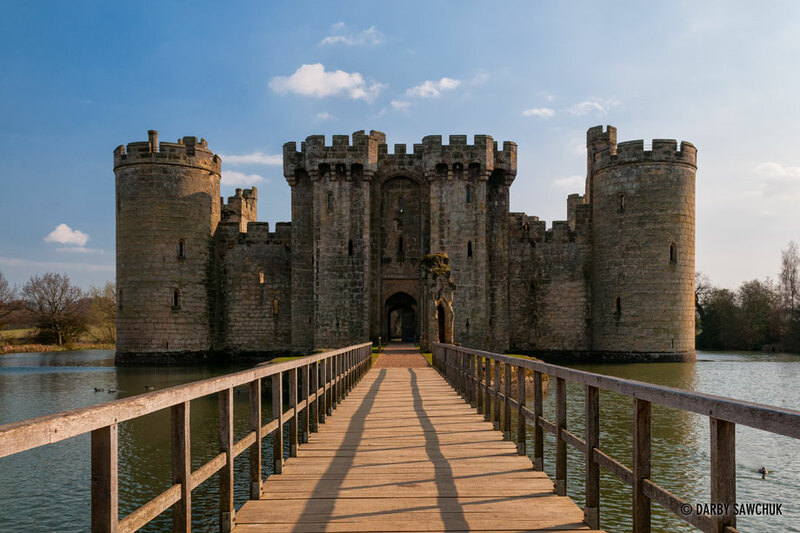 If you ever drew a picture of a castle when you were a kid, chances are it looked something like Bodiam Castle. The moated castle is near archetypal in its appearance. The imposing towers, the solid ramparts, the bridge and moat. It’s all just perfect. If I had any of my childhood drawings, I could probably find one that has a castle that looks just like Bodiam. For more images of Bodiam Castle, visit my gallery of images from Southeastern England. Today’s photo comes from my recently-published gallery of photos of Southeastern England. My time there was spent getting over a pretty nasty flu, so I didn’t make any heroic efforts to try to catch many sunrises and sunsets while there. Fortunately, the weather was generally cooperative during the day and after sleeping in a bit, I was still able o get some nice shots of the area. 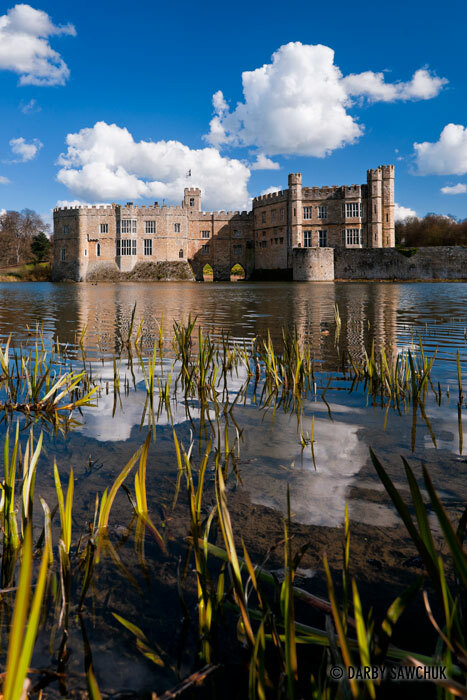 This is Leeds Castle in Kent, a remarkably lovely castle. While wandering through its impeccably-manicured gardens, it’s hard to think that it was originally built for the purposes of fortification – it’s far too peaceful a place to be built in preparation for battle. 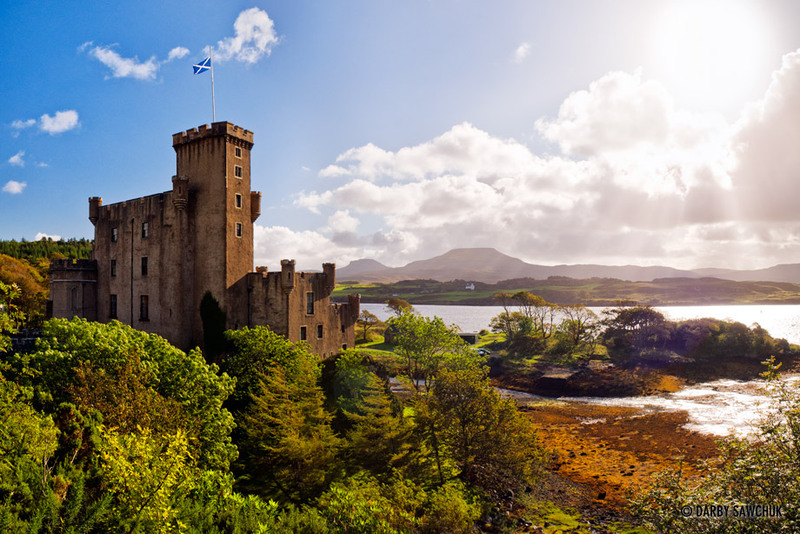 This view of Dunvegan Castle on Scotland’s Isle of Skye required that I grow a few feet to get a line of sight over the trees. I’ve been trying for years, but I don’t seem to be getting any taller, so I took to the branches to gain some height. I can’t say I recommend precariously balancing yourself in a prickly tree with a camera in one hand trying to keep steady enough to take a photo, but sometimes that’s just the only way to get the shot. It was no more than a few feet off the ground, but those few feet made all the difference. My goal with this shot was to be able to get the castle and MacLeod’s Tables in the same shot. They’re the two unique flat-topped hills you see in the middle of the background. Here’s the last one for now from Eilean Donan Castle. This is also from from this evening that threatened to kick up a serious storm with these brooding clouds. The rains never came in force, so I was able to capture this without getting too wet, though I did have to clean off the lens a few times. Scotland’s dramatic weather made for a colourful, moody background to this gorgeous location. 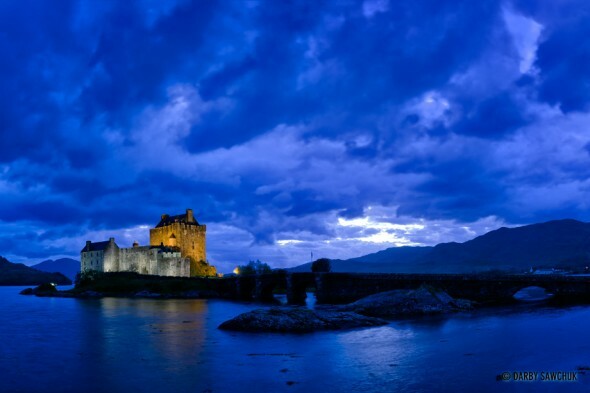 Stormy skies gather in the evening above Eilean Donan Castle in Scotland. The last photo of the day was a bit far away from Scotland’s Eilean Donan Castle, so we’ve moved closer and in this shot. Now, we’re ready to cross the bridge on the way out to the little tidal island that is home to one of the UK’s loveliest castles. Happy 2012 everyone! Let’s start the new year off with a photo of one of my favourite places on earth: Eilean Donan Castle. This is one of the first castles I ever visited and I’ve been hooked on the things ever since. I grew up reading Tolkien, C.S. Lewis and whatever other fantasy novels I could get my hands on, so if I couldn’t spend any time around knights or dragons, a castle would suit me just fine. Unfortunately for me, you don’t find a lot of epic castles in western Canada. So when I took a trip to Scotland in the year 2000, I was awestruck. All my romantic, idealised visions of medieval Europe came to life. I had never walked a castle’s walls until Eilean Donnan, so it holds a pretty special place in my fantasy-loving heart. After all, you never forget your first castle, right? It was just as great when we got the chance to last year. This particular shot of the castle deviates from the usual views you’ll spot on the postcards in that it’s shot from the East to the West. The castle itself doesn’t cut quite as interesting a profile from this side, but this blossoming sunset was too good to pass up especially after a mostly rainy day driving up from Northwest England on our way to the Isle of Skye. This panorama was a challenging one to get exposed properly. The sun obviously overwhelmed the scene on the left side, so I bracketed exposures through the whole panorama. There was a fair amount of post-processing work that needed to be done to align the photos and get the different exposures working together, butI got there in the end to reveal this photo which captures some of the warm glow that bathed the castle that evening. Picturesque Conwy castle steadfastly watches over the boats bobbing in the water below. This beautiful town in Wales is dominated by the medieval fortress at its heart which has the effect of making the town look rather good from just about any angle. The hill occupied by Beeston Castle rises up strangely from the middle of the flat Cheshire plain. For as far as you can see, this and the other small hill occupied by Peckforton Castle nearby are the only elevated points. The rest is as flat as England ever seems to get. A panoramic shot seemed to be the only sensible way to try to capture the vista from on top of the hill. Blessed with an almost perfectly clear day, who knows how many English counties I could see over the tops of those ruins.